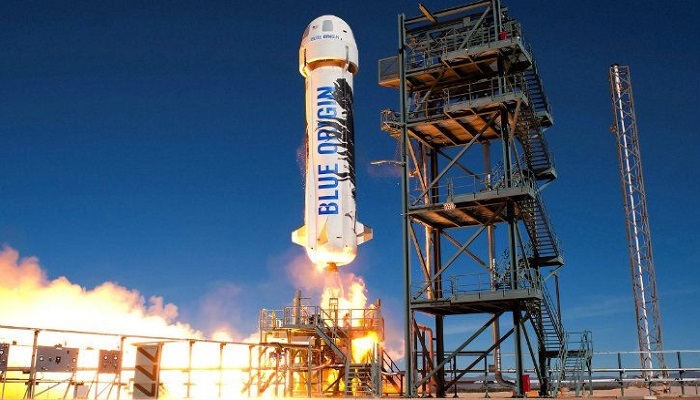 Jeff Bezos will charge up to $300,000 for a trip into space with his rocket firm Blue Origin. If you can’t be an astronaut and shoot off into space, what’s the next best thing? Paying for your ticket and going on a space trip anyway. The space tourism company, headquartered in Kent, Washington, is looking to sell tickets aboard its rocket for around $200,000 to $300,000, according to sources with knowledge of the plans. Earlier this year, Blue Origin confirmed the maiden voyage of its six-seater craft will be held in 2018. Blue Origin’s test flights have done eight successful takeoffs and landings, with the return of the New Shepard on the rocket’s tip — all of these flights also had human-sized dummies inside. Sitting at the tip of the Blue Origin rocket will be New Shepard, a passenger capsule vehicle which will house Earth’s space-faring and well-off tourists. The New Shepard is designed to autonomously fly up to six passengers more than 62 miles (100 km) above Earth and into suborbital space. At this altitude, customers will be able to experience a few minutes of weightlessness, as well as seeing the curvature of the Earth. The New Shepard craft features six observation windows, which Blue Origin says are almost three times taller than those on a Boeing Co 747 jetliner. Bezos’ space exploration company has already completed eight test flights of the New Shepard at the company’s Texas launch pad. The company is hoping to test its capsule escape system in space, ‘within weeks,’ one of the employees said. This feature is designed to protect the human crew in emergencies by propelling the capsule away from the booster should the rocket explode.